Phone-related frauds are on the increase and Toronto Police is reminding the public to be vigilant. A total of five Torontonians have suffered combined losses of $5.1 million through the fraud and investigators believe there may be more victims throughout Canada. 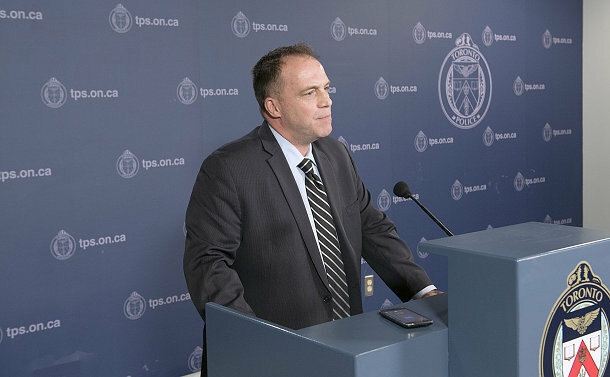 At a press conference at police headquarters on February 9, Detective Sergeant Ian Nichol said fraudsters posing as retailers have been contacting members of the public, alerting them to a fraud in progress that involves the use of their credit card account. Nichol said the victim believes they have contacted police via 9-1-1 and/or their financial institution. Instead, they have actually being re-directed to an imposter posing as a 9-1-1 call-taker or bank employee. Nichol said the scheme may vary in detail from person to person depending on the circumstance. He also said there is no specific demographic that’s been targeted. “It appears to be a true mass-marketing scheme in the sense that there are certainly hundreds of thousands of attempts that have been made,” said Nichol. Based on evidence, police believe the scheme is being conducted nationwide and hundreds of thousands of people have been targeted. Investigators also said there is evidence to indicate that in certain cases, the callers may already possess some of the banking particulars of the intended victim. Nichol reminded the public that 9-1-1 is for emergencies where persons or property are at risk and that 9-1-1 call takers will not forward their call to a police investigator. Nichol also warned the public that they shouldn’t assume that phone numbers appearing on call display screens are accurate. “Readily available ‘call-spoofing’ technology is frequently utilised by criminals to provide inaccurate call information,” he said.